Here at Copenhagenize we've learned that a new campaign about right-turn collisions is underway from the Road Directorate and friends. You can bet that the communications people from the Road Safety Council have their car-centric fingers in the soup, too. A group of people were called in to a feedback session for Megafon where they were presented with the new campaign and were asked to give their impressions about it. 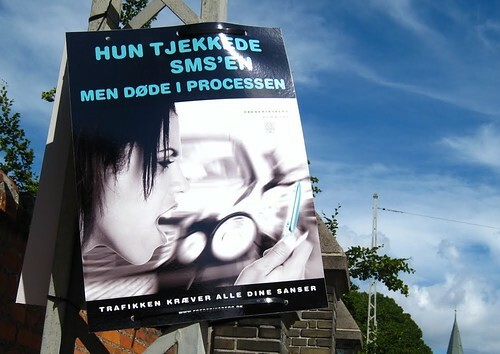 By all accounts, the Danish population can look forward to more classic Ignoring the Bull messaging from people who seem to lack basic marketing skills. We only have a verbal and written account of the upcoming campaign from a couple of the participants but it is clear that little has changed in the field of behavourial campaigns. Nobody has woken up and smelled the emotional propaganda. The campaign is primarily posters for busstops and the sides of busses. There were different proposals that the group were asked to comment on. Different texts and images. All of them featured women. - "Hun tog chancen, han skreg efter ambulancen"
- "She took the chance - he screamed for an ambulance." Ah... now we see a pattern. The campaign was likely produced by the same 'visionaries' that whipped together the above car-centric campaign, which we have blogged about before. So it's clear that there are no new dumplings in the soup - to confuse you with a strange Danish expression. The user group apparently gave a solid thumbs down to the "She took the chance, he sreamed after an ambulance" text and the other texts were even worse, according to our moles. There is also a radio spot with a woman singing a version of a Danish childrens song - similar to the American Ten Little Indians but with Ten Small Cyclists. Predictably, the song involved lyrics about five cyclists cycling down the street. Four stopped and one continued on without looking - cue screeching brakes and a woman screaming. The website to accompany the campaign was just as visionless and car-centric. The panel gave it a thumbs down, too. Five pieces of advice for avoiding right-turn collisions. Wisdom like "watch out for trucks", "look around", "keep eye contact" and so on. Why do safety nannies insist on condescending to people? There was also a campaign aimed at motorists, which another panel allegedly was giving feedback on. With five pieces of advice for avoiding collisions with cyclists. Not surprisingly, none of the five was "Leave your car at home", "Take your bicycle or public transport". It boggles the mind that public funding continues to be used in flawed campaigns that serve no purpose other than scaring people off of bikes and making car travel look like the preferred way to get around.